When people think of digital signage they don’t normally think about PowerPoint. Yet PowerPoint is a fantastic content creation tool for creating professional multimedia digital signage. This article will present 10 reasons for using PowerPoint digital signage. We will focus primarily on the benefits for small businesses. Let’s face it, digital signage has become an essential sales and marketing tool for business. Most big companies have embraced in-store digital signage to promote their products and services. However, the take-up rate for small business has lagged, causing them to miss out on the many important benefits. There are two basic reasons why small businesses do not use digital signage: cost and complexity. Using PowerPoint for digital signage addresses these two points head on by providing an affordable and easy to use solution. We will also present PowerPlayer™, our low-cost PowerPoint signage TV player and content management service. PowerPlayer makes it easy to display PowerPoint presentations on any standard TV. It delivers on all 10 reasons for using PowerPoint digital signage in your business. PowerPoint is very easy to use. Of the 10 reasons for using PowerPoint digital signage, ease of use is certainly #1. Contrast PowerPoint with most digital signage products that have very complicated, proprietary software. This is a big barrier to entry as most small businesses do not have in-house IT staff. Because most small business users already own and know how to use PowerPoint it’s an easy transition to using PowerPoint to create suitable digital signage presentations. There is no learning curve. When it comes down to it, digital signage is just a presentation that is displayed on a TV screen. So why not use one of the best presentation tools to create your digital signage. PowerPoint has evolved from a simple program used for business presentations into a complete, professional content creation tool. Any PowerPoint presentation can be used for digital signage. All you have to do is setup your PowerPoint to auto-run in a continuous loop. Normally you just need to specify the display time for your slides and select kiosk mode for the presentation. Once this is done your slides will advance without any mouse or keyboard actions. When the last slide is reached the presentation will loop back to the first slide and resume playback. Take a look at our PowerPoint to Digital Signage Guide for more details. Creating digital signage presentations is all about designing eye-catching screen layouts. PowerPoint offers very flexible drag-and-drop screen layout features that allow you to design very professional signage presentations. Let’s face it: plain text is boring. To catch customers’ attentions you need to display something that draws them in. PowerPoint allows you to combine text, graphics, pictures, animation effects and HD video to produce stunning multimedia digital signage customer displays. Perhaps you see the value of digital signage for increasing customer awareness of your products and service. Now who’s going to create your fabulous multimedia TV display? You’re not likely to have any in-house graphic designers to draw from. The solution: use widely available PowerPoint design templates. There are literally thousands of PowerPoint design templates–for virtually any kind of business. PowerPoint templates provide a solid graphic design that can be used to create great-looking digital signage presentations. And the good news is that most PowerPoint templates are free of charge or very inexpensive. Another option is an online outsourcing service like fiverr. With fiver get scores of graphic designers to bid on creating your PowerPoint presentation. It’s possible to get a custom PowerPoint signage presentation done for as little as $5. For more demanding presentation designs use professional content creation tools like Adobe Photoshop or Illustrator. PowerPoint makes it easy to import these “pages” into your PowerPoint presentation. You can mix-and-match imported pages with your standard PowerPoint page content. You can use editing tools like Adobe Premier to create cutting-edge video ads. PowerPoint supports standard h.264 MP4 video so it’s also easy to import HD video ads into your presentations. As always, you can mix-and-match video with standard (or other imported) PowerPoint page content. People like catchy animation effects. They grab your attention. Because of this customers spend more time looking at them. PowerPoint supports animated transitions between slides that allow you to highlight the change from one message point to another. PowerPoint also allows you to animate text and objects. With animation you can tell a compelling story, take your customers on a small journey. There is no need to purchase expensive TVs to display your digital signage. You have the option of displaying signage presentations on low-cost, consumer-grade TVs. Furthermore, PowerPoint gives you the option of displaying your digital signage presentation in a landscape (horizontal) or portrait (vertical) orientation. Most small business already own Microsoft Office so they can use PowerPoint to create signage presentations right away. But what about software licenses needed for displaying PowerPoint presentations on your TV screen? Microsoft provides the free PowerPoint Viewer which can be used to display your PowerPoint signage presentation on the TV screen. The result: no additional software costs associated with PowerPoint presentation TV display. PowerPlayer™ embodies the 10 reasons for using PowerPoint digital signage in your small business. It’s a low-cost digital signage player designed to display PowerPoint presentations on your TV screen. 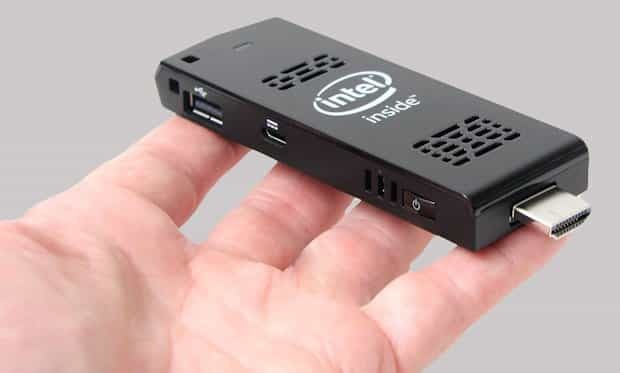 PowerPlayer is a pocket-sized Window 10 PC stick that plugs into your TV’s HDMI source input. PowerPlayer is bundled with PowerSignage™, our cloud-based content management service (CMS). PowerSignage CMS makes it easy to upload, schedule and display PowerPoint digital signage presentations on your TV screens. PowerPlayer automatically downloads the PowerPoint digital signage presentation from the CMS and displays it on your TV screen. There are 10 reasons for using PowerPoint digital signage; ease-of-use, flexible content creation, multimedia support and low-cost are some of these. We developed PowerPlayer to deliver these benefits to small businesses looking for a simple, yet flexible way to display digital signage. For more information about PowerPlayer please visit our website at https://www.powerdigitalsignage.com. Microsoft, Windows and PowerPoint are registered trademarks of Microsoft Corporation. PowerPlayer and PowerSignage are trademarks of Power Media Design. Copyright © 2018 – Power Media Design – all rights reserved.